Mar 24, 2010 The project LiLa will stage a special session during the IEEE EDUCON conference 2010 in Madrid. Mar 24, 2010 The 5th LiLa Project Meeting will take place in Madrid on April, 12th and 13th. Oct 1, 2009 1./2. October 2009 Meeting of the LiLa project partners. 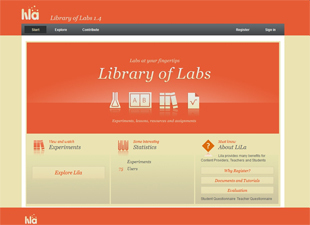 Visit the LiLa-Portal at www.library-of-labs.org. remote experiments (real laboratories which are remotely controlled via the internet). Moreover LiLa creates an organisational framework for the exchange of experiments between institutions and for the access to experimental setups. Supporting this, Lila provides contract templates for institutions and didactical help for lecturers for the integration of remote and virtual experiments into curricula. Primary target groups of LiLa are university teachers and their students in undergraduate and graduate classes of the natural sciences and engineering. Learn more by watching the "LiLa Results Presentation".